Geographic Information System (GIS) technologies have revolutionized our ability to grasp how space, place and identity intersect. But while the advances of the digital age have taken us far in mapping accurately socio-historical relationships and patterns, the aesthetics of early mapping—inaccurate yet gorgeous—still carry tremendous visual appeal. Remappings seeks to bridge the gap between old and new mapping processes, and in so doing retell the story of Jewish-Christian interaction in England before the period of resettlement during the late 17th century. For first stage of this project, we are creating an interactive map of England that charts the presence on the island of Jews, who continued to inhabit or visit England long after the 1290 expulsion. 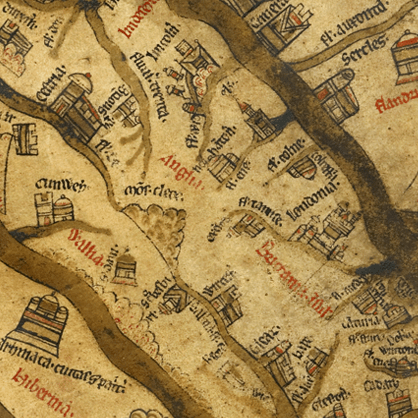 This interactive map embraces the aesthetics of such maps as the Gough Map, one of the earliest maps to represent England. Subsequent stages of the project involve creating interactive city maps that feature information about key figures, texts and events associated with urban sites. The story of the Anglo-Jewish presence in England is fraught. The largest massacre of Jews in 12th-century Europe occurred on the island, in the wake of King Richard I’s coronation in London. Waves of rioting throughout England culminated in 1190 in York, where some 150 Jews seeking safety in the city tower committed suicide when it become clear that there was no way to avoid the Christian mob. A century later Edward I commanded an unprecedented expulsion of Jews from England. There is no single best way to memorialize and describe such charged events. Therefore Remappings will provide links to multiple and various artistic, historical and scholarly accounts and interpretations. Remappings seeks to present a balanced account of Jewish-Christian interaction. While some links will concern anti-Jewish aggression and oppression, others will offer information about Jewish agency and independence, and evidence regarding neighborly and genial relationships between Christians and Jews. Remappings also promises to elucidate locations and points of interactions that are typically less visible in traditional written and visual representations of English literary history.